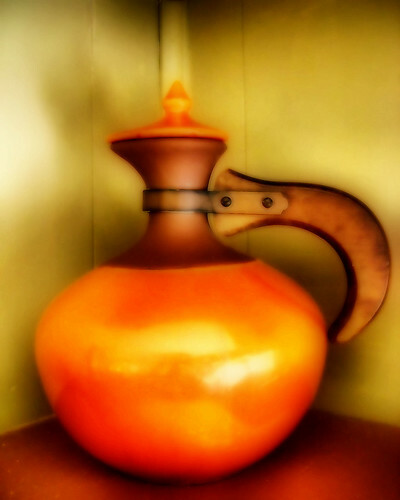 The morning after the 9/11 attacks on the World Trade Center, my husband, George broke an orange pitcher. I came unhinged. I screamed things and threw things better left unsaid and unthrown. I tore at my hair. I wailed. I collapsed to the floor. I over-reacted in grand style. In my defense, I'll add that this was a vintage Bauer Pottery piece of a type I've seen listed for seventy-five to a hundred dollars. More than that, it was the pitcher I'd dropped ladybugs into for safekeeping when I was four. This pitcher was special. Still, I'll bet you've already guessed that my meltdown had less to do with broken pieces of pottery and more to do with broken towers, broken lives, and a broken sense of security. Weeks later, George walked in from the garage and presented me with the orange pitcher, now mended with an industrial epoxy resin he uses for auto body repair. Sound far-fetched? Take a look. I think you'll agree it's more beautiful and more meaningful than it ever was before, and for the first time ever, it's a one-of-a-kind, fresh and unique new creation. It now sits in my office as a reminder that my husband is a wonderful man, and that redemption happens, all the time. Have you noticed? We are told, in Ephesians 5:16 to redeem the time. This time we're living in now. We're supposed to redeem it. To mend and re-name it, just as Jesus re-named Abraham and Sarah, and Peter and Paul, and you and me. "For the days are evil," it says, and it does seem so. No matter where you live, you see and feel the uncertainty, the diminished hopes brought on by a global economic crisis. If you're a writer, you've spent years struggling with the tension between a perceived pressure to write to the market, and a desire to write something fresh and unique. The truth is that the market loves fresh and unique things if they strike the right chord (you and your publisher get to guess what will do that), but if nothing strikes that chord, the market will settle for the familiar. Fewer and fewer publishers still in business are in a mood to guess, so more and more seem to settle for familiar names, familiar styles, familiar themes. "Ha!" I hear you say. "Redeem that, if you can." A few months ago, there was a big fire in a nearby town that destroyed several homes. Many homeowners were devastated, but one woman, I am told, felt an unexpected sense of freedom. It seemed that someone had dumped her entire box of blocks, and now she had an opportunity to put them back, but better, more thoughtfully this time. Is it possible we have the same opportunity? "Much of the foundation of the Harlem Renaissance was set by the African-American historian and social theorist W.E.B. DuBois (who) asserted a new sense of black cultural consciousness and pride, inspiring a generation of young writers and artists to create a distinctive African-American voice." A distinctive voice, woven by many, among them Langston Hughes, who wrote his poems to the beat of jazz music. Might it be time for a Christian Renaissance? I mean, don't those two words just fit together? Do we have (can we find) a culture distinct from the wider society, something we can take pride in and nourish into something new? A distinctive Christian voice that we can cultivate, infuse with a music all our own? Now that our blocks are dumped, can we take a few risks, experiment and play? Could we start a movement? The impressionists did in the 1870's. They rejected the photo-realism of previous artists and painted reality with movement and light mixed in. Their paintings, they believed, were more realistic representations of what the eye actually sees. The modernist authors of the early part of the last century explored ways of depicting objective reality when recent thought had called into question the existence of objective reality. The Inklings, CS Lewis and JRR Tolkien among them, sought ways of writing stories so infused with spiritual realities that readers might feel that they'd been touched through the veil by something - or someone - holy and transcendent. Throughout history movements have been propelled by artists and authors in bad times with little to no hope of recognition, but with an insistence on new ways of creating that allowed them to say things that screamed to be said. So much screams to be said right now. Of course, we may have to sort out what it is, in order to write it (or while we write it) but what higher calling? And what better place to redeem than the desert? Didn't God say so himself? If we started a new Christian Renaissance, how might it sound on the page? What might be different? If it were an art movement, what colors and what strokes? What is our culture, anyway? Do join in. We love to read what you have to say. I LOVE this thought! A Christian Renaissance. Oh to re-learn what it means to be a servant of the One who chose a BOOK to be His way of communicating with us. I have a small (and growing) group of writer-friends, all of us passionately committed to seeing our God-books in secular bookshops. I love looking at the books in K-mart, and seeing the word "God" in the title or the by-line. Yes, most of them are about "higher consciousness" or general "spiritual searching", but there's a spiritual element that wasn't there a few years ago. I feel there's a shift coming (in Australia at least) where people are opening up that door of searching again, and that in times to come publishing houses won't be scared off by Jesus. What will it take? People to push through with the smaller, indie secular publishing houses rather than opting for the more traditional Christian market. Fresh voices, fresh stories. I wouldn't want to see a HUGE amount of difference between the style or content of Christian books and those of secular ones - it's people and their stories after all. Sometimes in life there are no doors that you can find. But for the Christian there are many, many more windows. Excellent post, Katy. Made me think about the fact that the Gospel means literally "good news." The way it most authentically plays out in both the Bible and in good Christian writing is that God Himself does the redeeming-- it's nothing we CAN do ourselves. My first novel (unfinished and unpublished) has as its theme redemption -- played out in the life of a widower who has watched his wife succumb to cancer and then is in a situation where he hopes to rescue a woman lost in a snowstorm. Can he redeem someone else as a way of easing his own suffering? The answer to this scenario and all such scenarios in Christian writing is that no, we can't redeem ourselves or anyone else -- but God allows us, both as people and as writers -- to participate in the process. Second, it led me to believe the color--the strokes you mentioned are alive with vibrant shades of orange. God calls us to be bold for Him. Bold and loving. Latayne, your first book sounds like something I'd devour. I love how FB leads me to connect with other people, and i find fresh new ideas in the posts i find. i love your post, and the ideas. go for it! As one who is sitting pouty-lipped in front of her tumbled-down blocks, your post is a balm and a rallying cry. Yes. A Christian Renaissance. Sign me up. Beautiful post, Katy. I especially loved: "The Inklings, CS Lewis and JRR Tolkien among them, sought ways of writing stories so infused with spiritual realities that readers might feel that they'd been touched through the veil by something - or someone - holy and transcendent." Touched through the veil ... more than anything that's what I'd like to accomplish with my writing. Brilliant! A redemptive renaissance...I love it! The paragraph about Tolkien and Lewis really resonated with me--I've always said that if I was half as good as either of them, I'd be satisfied with my writing. I'm with y'all on the Christian Renaissance. Let's go! I'd have to say that it would sound like the battle cry of taking back what was stolen from us in the literary world. We were here first, we children of God. We were speaking and writing His words long before the secular world thought they could mussle in and take over. Ha! Christian writers should understand the grand responsibility we have to reclaim the bookshelves and airwaves with words that uplift, enlighten and encourage - pointing to the One who created us and the words we write. Sorry, you kind of got me going there. Happy Thanksgiving all of you. I'm signing up for the Christian Renaissance. Megan, consider how Jazz started out as an African American invention, and now All America listens, plays, claims it for its own. Or the way Magical Realism, the style of writing which weaves fantastical, miraculous elememts with realistic ones, and the characters observe and accept it al without surprise or wonder. That style took root in South American fiction and made its way up the continents into such novels as The History of Love, in which the main character has hidden so long from the Nazis, has made himself disappear so long, that when he comes to America he finds he doesn't show up in photographs. I've heard it said that Tolkien invented the modern fantasy novel. What if Christian Renaissance fiction worked something like that? What if Christians found new, creative ways of expressing the presence and workings of God in a story in a way that was essential not only to the plot (perhaps not to the plot at all?) but to the very style of the writing? What if Christian authorss experimented, played ideas off each other, jammed with each other somehow, the way Jazz players did? Latayne, perhaps our part in redeeming the time is to open up to the idea that perhaps a dumped box of blocks is a good thing. Isn't that something like faith? And your first novel sounds wonderful. Written by you, it would be. Wendy, thanks. I love the pitcher, too. And bold and loving sounds fatastic. Anonymous, welcome! I'm so glad you found us. Introduce yourself sometime. Patti honey, you are so signed up. Sharon, me too. The thing I love about you and all the Novel Matters ladies is the way they stretch for that ideal, and the beautiful writing that emerges. Jan, hear hear! Now you're talking about a Christian cultural history, aren't you. Can you expand on that? How would we describe it? What names and what works? Lynn, Heather and Maria, you are signed up too! This is one of those times I wish Blogger had a "Like" button. "What if Christian Renaissance fiction worked something like that? What if Christians found new, creative ways of expressing the presence and workings of God in a story in a way that was essential not only to the plot (perhaps not to the plot at all?) but to the very style of the writing?" So much to think about! I keep coming back to the idea of expressing a Holy Spirit consciousness (both in those who embrace it and those who are running), and a place where the miraculous is second-nature. "...What if Christian authors experimented, played ideas off each other, jammed with each other somehow, the way Jazz players did?..." This is VERY good. Hey I know, you can all come round for dinner next Thursday : ) Let's start this thing!!! Many new denominations started out of a desire for the renewal of the old. The problem was, the old (wineskin) couldn't contain the new (wine). John Wesley's desire was not to leave the Anglican church, but the movement he started had to if it was to be true to themselves and the task God had given them. For this reason I don't think the CBA can handle a Christian Renaissance. When the majority of agents and publishers read their fiction from the general market, you know something is amiss. Making the move to write "faith based" book in the general market will have several positive results. The first result will be that the quality of writing will increase. One will really need to know and hone their craft if they want to succeed. The second positive thing is that the fiction will not be preachy. It won't get accepted in the general market if the only way you can share your message is to preach it. When the seed fell on the road in the Parable of the Sower, Jesus said it represented the Gospel being shared with someone in such a way that he/she didn't understand it. Who's fault is that? As Sowers, we need to be doing a better job of dialogue with readers about how faith intersects with life. The third positive aspect is that authors may find the readers they can't seem to find in the CBA. I am aware that a vast number of Christians read in the General Market. If you write for the CBA market, are you not limiting yourself to the small numbers that "niche" market holds? I have read a debut novel averages 5,000 books sold. To work full-time as a novelist, that would mean 6+ books published A YEAR. A self-published book averages 75 (a study of 10,000 books). So, find some friends, hone your craft, and be on the cutting edge! What food for thought! A Christian Renaissance. I love the idea and I really want to be a part of it. Come on writing skills, get on board (talking to myself here).